Elliptic curve cryptography has been widely used in public key cryptography, which applies shorter keys to achieve the same security level of RSA cryptosystems. 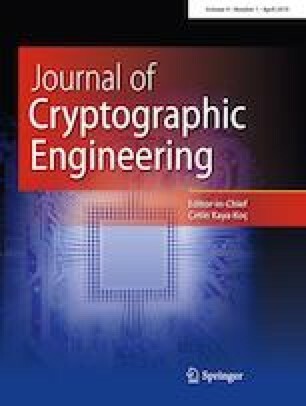 This communication advances a fast unified hardware architecture for elliptic curve point multiplication over NIST primes. The improvements of this work include word-based modular division, parallel point additions and doublings, and pipelined scalable multiplications and modular reductions. The hardware integrates computation for five NIST curves and can compute one time of NIST-192/224/256/384/521 elliptic curve point multiplication in 0.437/0.574/0.776/1.57/2.74 ms with Xilinx Virtex IV device, costing an area of 21,638 slices, 32 DSPs and 26 kbits of RAMs, which outperforms most results as far as we know. The author would like to thank the comments of editors and reviewers. This work is partly supported by Shenzhen postdoctoral financial aid, and Guangdong engineering research center for healthy living.